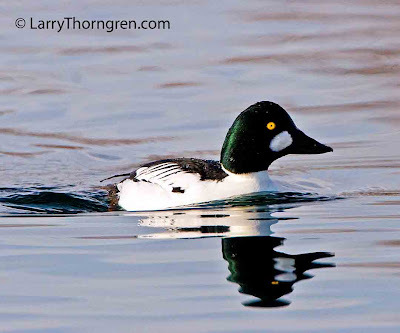 Goldeneyes are rather shy. I have seen this duck on several occasions and he always keeps his distance. He finally swam close enough for a photo, but is still too far away to fill the frame for great detail. I had to enlarge him a lot for this post. This is truly a Goldeneye duck and I really like this picture.It is very neat and clean.I always like to see your new photographs..I like that you also give some information with photograph.